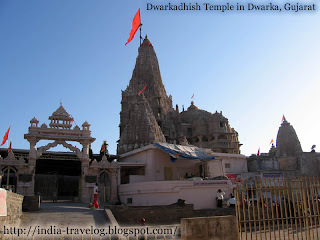 Dwarka, located in the Jamnagar district of Gujarat, was the abode of Lord Krishna. 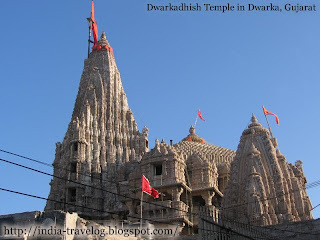 It is believed that due to the destruction by the sea, Dwarka was submerged six times and the Dwarka that we see today is the seventh city to come up in the same place. 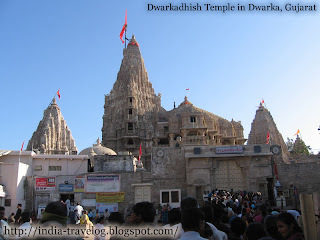 Dwarka is located close to where the River Gomati merges into the Gulf of Kutch. The temple has a five-storey structure, which is supposed to be built by Sambha, the grandson of Lord Krishna. The city was designed and built by Vishwakarma, the great architect. The temple is made of limestone and sand. 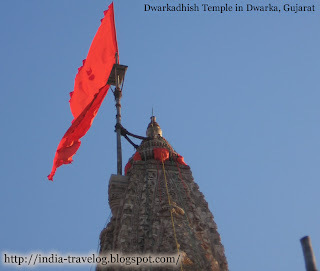 A huge lovely red flag is hoisted in the temple tower four times each day. 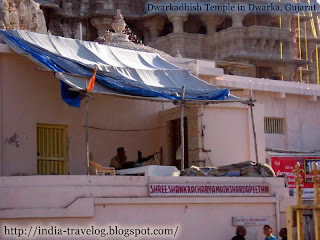 There are two gateways to the temple – the Swarga Dwar, where pilgrims enter, and the Moksha Dwar, from where the pilgrims exit. The temple is well guarded with Black Cat Commandos positioned around the temple. The security is very much needed if you look at the sheer number of people who visit the temple everyday. 9:00 a.m. to 1.00 p.m.
3.00 p.m. to 6.10 p.m.